Love plays a central role in our emotional wellbeing, and expresses itself in many different ways. “My first year at university was pretty tough. I was 18 years old, had just moved away from home, felt overwhelmed by the intensity of the academic demands being made of me, and was chronically tired because in addition to the high number of hours required for lectures, practical lessons, and study, I was also working two jobs to try and make ends meet. But that year also taught me a lot. I had a Sunday job as a nurse’s aid. I would get a call from an agency at about 5.30am in the morning and be despatched to whatever nursing home needed help that day, ready to start work at 7.00am. Like most things in life, the job was what you made it, and I did everything that you might conceivably expect to be required in that kind of environment, including heavy lifting, showering, shaving, feeding, toileting and generally looking after people who were frail, elderly, and sometimes suffering from dementia. I met some real characters that year. There was Cliffy, a gentle joker who loved talking about the football. One day – after I had given him a bath, gotten him dressed and taken him back to his room – he appeared at the door of the common room with his pyjama bottoms down around his ankles to remind me (with good humour and a smile on his face!) that I had forgotten to put his singlet on and – self evidently – to tie the drawstring on his trousers! Cliffy didn’t wear underpants!! 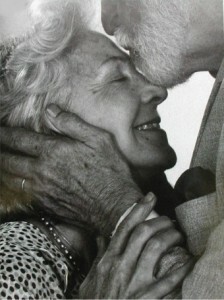 This couple were well into their 90’s, and they resided together at a particular nursing home. The gentleman was in reasonable health, but his wife had suffered from Alzheimers Disease for some time and seemed to exist in a world all of her own. One day, they were sitting together in the common room with a number of other people resident in the home. I was in the room shaving another man, when the husband caught my attention and beckoned me over to him. He quietly pointed out that his wife had just lost control of her bladder, and that the floor was now wet and slippery. I told him not to worry – I would take his wife back to their room, clean her, get her changed into some fresh clothing, and then come back and clean up the mess. He told me that he could look after his wife, if I could just clean up the floor. So that’s what we did. After I had mopped the floor, I happened to walk past their room on my way to the laundry. As I glanced into their room, the man was slowly helping his wife out of her soiled clothing, so I paused in case he might need my help. But he didn’t need my help. He just kept on attending to his wife’s needs with the gentle tenderness a mother may use with a young baby – cleaning her, helping her into fresh clothes, and then taking a moment to tidy her hair. Throughout all this his wife said nothing, and her expression did not change. She seemed to have no way to acknowledge the love and care her husband had just shown her.